Find out how you can refund your tickets. 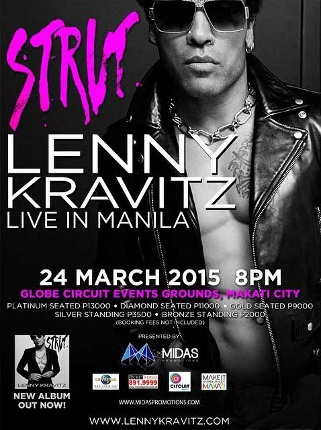 (SPOT.ph) Were you looking forward to Lenny Kravitz’s concert on March 24? It turns out you’ll have to wait a little longer to finally see him live. His show at the Globe Circuit Events Grounds has been cancelled due to unforeseen scheduling issues, and due to his current commitments, the concert has yet to be rescheduled. "I have been looking forward to coming to play for my fans and I'm deeply sorry that my concert had to be cancelled," said Kravitz. "My ability to come play for you all is a huge concern to me and I’m looking forward to rescheduling so I can perform for you in Manila as soon as possible." For refunds, call TicketWorld at 891-9999 or visit the TicketWorld website to view the detailed mechanics.